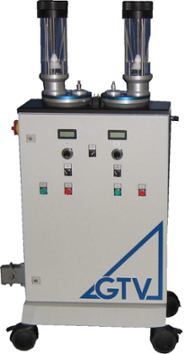 Spraywerx sells powder feeders for thermal spray and laser cladding. Configurations can vary and can be customized to customer specifications. Communicate your requirements to Spraywerx through the “Build Your Feeder” feature. The GTV PF 2/2 powder feeder is based on over 20 years well known PT Twin system. The GTV 2/2 is a further advancement of this earlier development. The GTV 2/2 has proven to be reliable in both thermal spray and laser cladding powder feed applications. Powder feeders can be customized for various applications. Click below to build your own custom feeder.